Is Cyprus next for a bailout? Cyprus has hinted that it may be asking for a bailout within days, after the situation in the country was described as ‘urgent’. CYPRUS COULD BE the next eurozone member to seek a bailout, after revealing that the situation is ‘urgent’. The issue is urgent. We know the recapitalisation of the [island's] banks must be completed by 30 June, and there are a few days left. Shiarly also said that he saw a potential bailout package as a “comprehensive request covering not only present circumstances and the recapitalisation of the banks but also future needs”. Michalis Sarris, the chairman of Cyprus’ second largest bank said on Friday that the country will have to seek bailout funds from the EU in order to recapitalise a banking sector pummeled by exposure to Greek debt. Cypus Popular Bank is the Cypriot lender most exposed to risk from Greek debt. It posted a record €2.54 billion loss last year after taking a 76 per cent write-down on its Greek government bond holdings. Yesterday Cypriot government spokesperson Stephanos Stephanou said that any financial assistance would come in the form of recapitalisation of the banking sector only. The Famagusta Gazette reports that Stephanou dismissed suggestions that assistance from the EFSF would be due to refinancing needs. 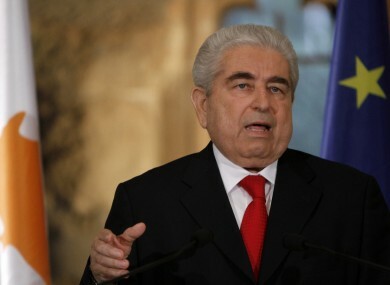 President Dimitris Christofias said meanwhile that a fresh package of spending cuts would not come at the expense of workers’ salaries and benefits. State coffers are running dry because Cyprus is unable to borrow from international markets after two credit ratings agencies downgraded it to junk status. The country is relying on a €2.5 billion low-interest Russian loan to see it through the year, and Christofias has said the government is looking to secure a similar loan, possibly from China. Last August the credit ratings agency Fitch predicted that Cyprus would need a bailout. Yesterday the prime minister of Spain – the latest eurozone country to secure a bailout – hailed it as a victory for his country and the EU. Germany has blocked Spanish attempts to have bailout funds injected directly to banks and not distributed via the government. Email “Is Cyprus next for a bailout? ”. Feedback on “Is Cyprus next for a bailout? ”.